Certified Information Systems Security Professional (CISSP) is an independent information security certification granted by the International Information System Security Certification Consortium, also known as (ISC)². As of December 31, 2018 there are 131,180 (ISC)² members holding the CISSP certification worldwide, in 171 countries with the United States holding the highest member count at 84,557 members. In June 2004, the CISSP designation was accredited under the ANSI ISO/IEC Standard 17024:2003. It is also formally approved by the U.S. Department of Defense (DoD) in both their Information Assurance Technical (IAT) and Managerial (IAM) categories for their DoDD 8570 certification requirement. The CISSP has been adopted as a baseline for the U.S. National Security Agency's ISSEP program. CISSP is a globally recognized certification in the field of IT security. In the mid-1980s, a need arose for a standardized, vendor-neutral certification program that provided structure and demonstrated competence. In November 1988, the Special Interest Group for Computer Security (SIG-CS), a member of the Data Processing Management Association (DPMA), brought together several organizations interested in this goal. The International Information Systems Security Certification Consortium or "(ISC)²" formed in mid-1989 as a non-profit organization. By 1990, the first working committee to establish a Common Body of Knowledge (CBK) had been formed. The first version of the CBK was finalized by 1992, and the CISSP credential was launched by 1994. The CISSP curriculum covers subject matter in a variety of Information Security topics. The CISSP examination is based on what (ISC)² terms the Common Body of Knowledge (or CBK). According to (ISC)², "the CISSP CBK is a taxonomy – a collection of topics relevant to information security professionals around the world. The CISSP CBK establishes a common framework of information security terms and principles that allow information security professionals worldwide to discuss, debate and resolve matters pertaining to the profession with a common understanding." From 2015 to early 2018, the CISSP curriculum is divided into eight domains similar to the latest curriculum above. The only domain to have changed its name was "Security Engineering," which in the 2018 revision was expanded to "Security Architecture and Engineering." Before 2015, it covered ten similar domains. Possess a minimum of five years of direct full-time security work experience in two or more of the (ISC)² information security domains (CBK). One year may be waived for having either a four-year college degree, a master's degree in Information Security, or for possessing one of a number of other certifications. A candidate without the five years of experience may earn the Associate of (ISC)² designation by passing the required CISSP examination, valid for a maximum of six years. During those six years a candidate will need to obtain the required experience and submit the required endorsement form for certification as a CISSP. Upon completion of the professional experience requirements the certification will be converted to CISSP status. Answer questions regarding criminal history and related background. Pass the multiple choice CISSP exam with a scaled score of 700 points or greater out of 1000 possible points. Have their qualifications endorsed by another (ISC)² certification holder in good standing. Number of CISSP members as of December 31, 2018. Information Systems Security Architecture Professional (CISSP-ISSAP), an advanced information security certification issued by (ISC)2 that focuses on the architecture aspects of information security. Information Systems Security Engineering Professional (CISSP-ISSEP), an advanced information security certification issued by (ISC)2 that focuses on the engineering aspects of information security. In October 2014 it was announced that some of its curriculum would be made available to the public by the United States Department of Homeland Security through its National Initiative for Cybersecurity Careers and Studies program. Both ZDNet and Network World have named ISSEP one of tech’s most valuable certifications. Information Systems Security Management Professional (CISSP-ISSMP), an advanced information security certification issued by (ISC)2 that focuses on the management aspects of information security. 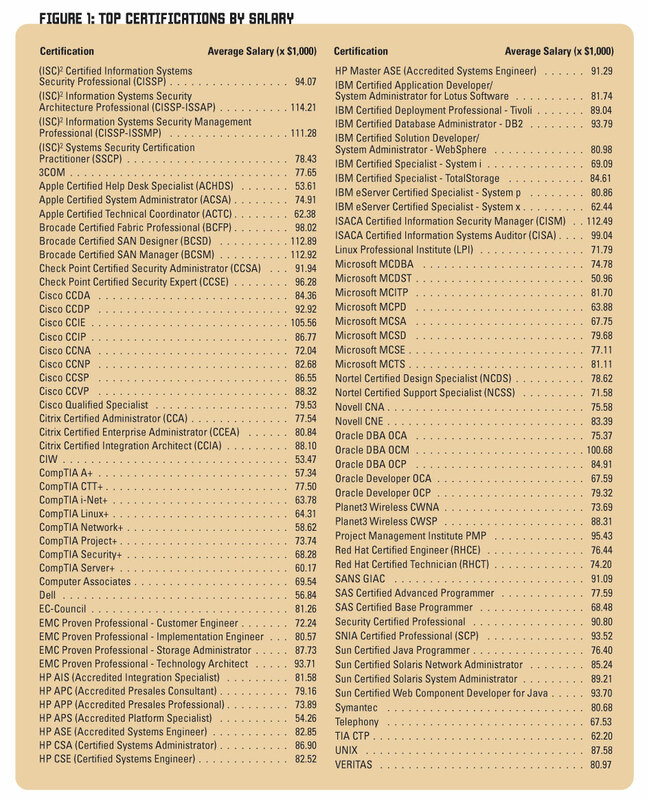 In September 2014, Computerworld rated ISSMP one of the top ten most valuable certifications in all of tech. The CISSP credential is valid for three years; most holders renew by submitting Continuing Professional Education (CPE) credits. There is also a yearly membership fee required to maintain certification. The Annual Maintenance Fee (AMF) must be submitted by the anniversary date. Once the CPE and AMF requirements are met, the certification will automatically renew for another three-year certification cycle. The certification will not renew until the current certification cycle expires. Typically, renewals are processed around the 1st and 15th of every month. After the certification(s) has been renewed, a confirmation email will be sent to the certification holder. An updated certificate and ID card will follow in the postal mail within 8 to 12 weeks. In 2005, Certification Magazine surveyed 35,167 IT professionals in 170 countries on compensation and found that CISSPs led their list of certificates ranked by salary. A 2006 Certification Magazine salary survey also ranked the CISSP credential highly, and ranked CISSP concentration certifications as the top best-paid credentials in IT. In 2008, another study came to the conclusion that IT professionals with CISSP (or other major security certifications) and at least 5 years of experience tend to have salaries around US, about US (or 26%) higher than IT professionals with similar experience levels who do not have such certificates. Note that any actual cause-and-effect relationship between the certificate and salaries remains unproven. As of 2017, a study by CyberSecurityDegrees.com surveyed some 10,000 current and historical cyber security job listings that preferred candidates holding CISSP certifications. CyberSecurityDegrees found that these job openings offered an average salary of more than the average cyber security salary. ANSI certifies that CISSP meets the requirements of ANSI/ISO/IEC Standard 17024, a personnel certification accreditation program. ^ "Member Counts". (ISC)². Retrieved 15 January 2018. ^ "(ISC)² CISSP Security Credential Earns ISO/IEC 17024 Re-accreditation from ANSI" (Press release). Palm Harbor, FL: (ISC)². September 26, 2005. Archived from the original on March 2, 2010. Retrieved November 23, 2009. ^ "DoD 8570.01-M Information Assurance Workforce Improvement Program" (PDF). United States Department of Defense. January 24, 2012. Retrieved April 12, 2012. ^ "NSA Partners With (ISC)² To Create New InfoSec Certification". February 27, 2003. Archived from the original on September 29, 2011. Retrieved December 3, 2008. ^ Harris, Shon (2010). All-In-One CISSP Exam Guide (5 ed.). New York: McGraw-Hill. pp. 7–8. ISBN 0-07-160217-8. ^ Conrad; Misenar; Feldman. 11th Hour CISSP. Syngress. ISBN 978-0-12-417142-8. ^ Tipton; Henry. Official (ISC)² Guide to the CISSP CBK. Auerbach Publications. ISBN 0-8493-8231-9. ^ "CISSP-Exam-Outline-121417--Final.ashx". (ISC)². Retrieved 20 Apr 2018. ^ "(ISC)² CISSP and SSCP Domain Refresh FAQ". (ISC)². Retrieved 15 May 2015. ^ "CISSP Professional Experience Requirement". (ISC)². 2009. Retrieved December 3, 2008. ^ "How to Become an Associate". (ISC)². 2009. Retrieved November 23, 2009. ^ "(ISC)² Code of Ethics". (ISC)². 2009. Retrieved December 3, 2008. ^ a b "How To Certify". (ISC)². 2009. Retrieved December 3, 2008. ^ "Endorsement". (ISC)². 2009. Retrieved August 2, 2015. ^ "Member Counts | How Many (ISC)² Members Are There Per Certification | (ISC)²". www.isc2.org. Retrieved 2018-12-21. ^ "CISSP® Concentrations". (ISC)². Archived from the original on 11 December 2014. Retrieved 17 January 2015. ^ "Maintaining Your Credential". (ISC)². 2009. Retrieved December 3, 2008. ^ Certification Magazine (2007-04-11). "Top Certifications by Salary in 2007". Certification Magazine. Archived from the original on 2007-03-29. Retrieved 2007-10-14. ^ Sosbe, Tim; Hollis, Emily; Summerfield, Brian; McLean, Cari (December 2005). "CertMag's 2005 Salary Survey: Monitoring Your Net Worth". Certification Magazine. CertMag. Archived from the original on 2007-06-07. Retrieved 2007-04-27. ^ Brodkin, Jon (2008-06-11). Salary boost for getting CISSP, related certs. Network World, IDG, 11 June 2008. Retrieved from http://www.networkworld.com/newsletters/2008/060908ed1.html. ^ CyberSecurityDegrees.com's Study of the Most Lucrative Cyber Security Certifications. Cyber Security Degrees. Retrieved from https://cybersecuritydegrees.com/faq/most-popular-cyber-security-professional-certifications/. This page was last edited on 16 March 2019, at 16:53 (UTC).